I Love Paris...at any time of the year and not just spring time! Home > Blog > I Love Paris…at any time! We like to advocate exploring all corners of France in your motorhome but remember to spend a little time in the capital too. You can take your motorhome to Paris and stay on the Paris Campsite at “Bois de Boulogne” or stop off for a day or two en-route to collecting your motorhome. 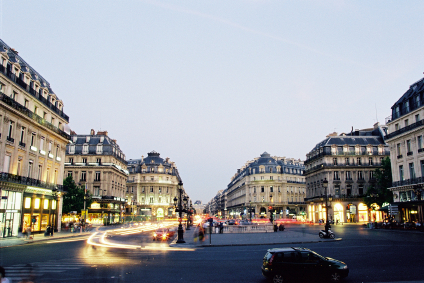 One time France Motorhome Hire employee, Declan Morgan, waxes lyrical about his favourite city. I have had a love affair with this city since a child. It was the city my family spoke of with reverence and when they finally took me there it all made sense…it is indeed a magical city. Days should always start with a coffee, and in my case a pain au chocolat, in a café watching the city prepare itself for the day ahead. Soak it all in and decide what aspect of Paris would you like to experience today. Paris is a city for walking; you turn a corner and there’s a street exhibition, another corner and you come across a full brass band of students busking, you see a building you had never noticed before or you simply get drawn in by a patisserie window. Art and galleries make up a huge part of my visit. If it’s your first time then the Louvre is the one…just to see that “smile”. I enjoy the Musee D’Orsay (www.musee-orsay.fr). This renovated train station hosts the most wonderful collection of Impressionist artwork and the building alone is worth the visit. If you’re looking for a way to see some great works while enjoying the sunshine, then an afternoon in Rodin’s Garden (www.musee-rodin.fr) is the place to be. Here for very small fee you can wander and sit among Rodin’s sculptures. Another gem is the Orangerie (www.musee-orangerie.fr). It contains the masterpiece, Monet’s Water Lilies in all their glory. Should you find yourself with a sunny Sunday afternoon to spare, then head towards Jardin de Luxembourg, and join Parisians in their pursuit of enjoyment. Sunday is a day of rest, shops are closed and the business mode is filed away for the day. Find yourself a chair by one of the many fountains and relax in the sunshine or buy a delicious ice cream, wander the park watching the locals play boules and then mosey over towards the bandstand and listen to the wonderful concert being played and all this for the cost of your metro ticket. Speaking of the Metro, this is a safe, fast and marvellous way to traverse Paris. Everybody uses this extensive and efficient underground network and once you have figured out how the schematic map works, you should enjoy the experience. At some stage during your travels you will probably find yourself in Chatelet metro station. This is a large and bustling station and each time I have passed through I have come across some wonderful busking. It’s worth the stop. For me the Eiffel Tower is the symbol of Paris, clichéd as it sounds. I loved my first sighting of it and as I travel around the city, I love glimpsing it from the corner of my eye. It’s comforting. It is a busy spot but when you climb up and look out over the city it all seems peaceful and worth battling through the crowds for. Then at night it turns magical…every hour it lights up in a blaze of glory for several minutes, this can be seen from a distance but I would recommend you experience it from the spot itself too. What to do at night apart from enjoying a meal and glass of wine some might ask? Why not go to the Opera (www.operadeparis.fr) or one of the many evening concerts you see advertised on the posters around the city. Looking for something a little different then I would recommend Le Limonaire, a small café tucked away which offers food and typically French entertainment. The smallest stage I have ever seen hosts some marvellous singers, actors and comedians. A boat trip down the Seine is a very touristy but fun evening thing to do; the City is just as charming lit up as it is during the day.